For parents of children who struggle to learn, finding effective intervention can be a challenge. The National Institute for Learning Development (NILD) has developed tools for learning that offer hope. Founded in 1982, NILD’s goal has been to equip individuals with learning disabilities to succeed academically and in life as independent learners. NILD Educational Therapy™ differs from tutoring in that cognitive and perceptual weaknesses are strengthened to support independent learning. This approach is individualized and intensive mediated learning. Compensatory techniques are avoided. Many of NILD’s techniques were developed through the work of pioneers in the field of learning disorders, such as Archie Silver, M.D. and Rosa Hagin, Ph.D. at Bellevue Medical Center in New York. In 1973, these techniques were introduced into a school setting. NILD is currently an international organization with over 1000 active programs in 46 countries. Deficits in perception and/or cognition impact the learning process and create uneven academic performance. The learning process is represented as a wall with various components. Perceptual and cognitive skills form the foundation of the wall. If any of these areas, such as basic skills and strategic thinking are weak or vulnerable, academic skills are affected. After cognitive and perceptual deficits are strengthened, the learning process functions efficiently. Students become able to learn independently. 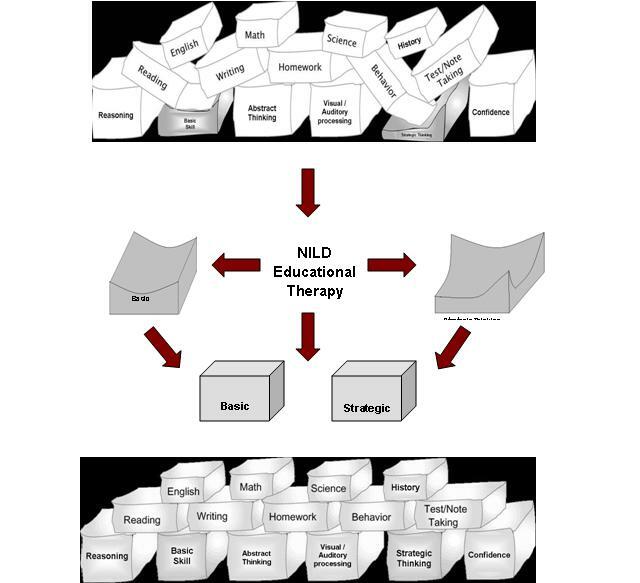 More like physical therapy or speech therapy, NILD Educational Therapy™ is boosting weak, vulnerable systems.